There is music everywhere! The American Treasure Tour has music in all its shapes and sizes - instruments, music boxes, mechanical music machines, record albums (and cylinders! ), audiocassettes, 8-tracks, flash drives. You name it, it's here. Our record album collection is pretty special because we get to honor the great musicians of the twentieth century. We try to honor them all here, but we can really only highlight one act at a time for fear of overwhelming you. 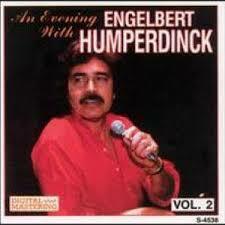 So today, we would like to call out Englebert Humperdinck! No, we're not talking about the German composer who died in 1922, but rather the former Arnold George Dorsey who borrowed the Humperdinck name for his own singing career. Born in 1936, he is still going strong, performing his classics at concert halls, casinos and other destinations across the country and overseas. Enjoy!